A look at the symbolism of the illustrations on the deck of 16th century German cards. I just put together a little video look at the rules of our Ringo game. Rank #3: So how old is Pente? Since we use glass drops as game piece for some of our portable fabric games we often have people think a couple of our games have something to do with the game Pente which was sold with glass drops as game pieces. The theme music is “Scully’s Reel/Mrs.McCloud’s/Cooley’s Reel” by the band Slánte from their Album Cup of Tea and is used under a Creative Commons share-alike license. I’ve put together another short video about one of the games we sell. This one covers the basic rules for 12-Man Morris as we prefer to play it. Our board was designed to be used either for 9-Man Morris, or 12-Man. Rank #5: Who are the kings & queens on playing cards? Until I finish my next question episode here’s the first of a series of short videos I’m working on covering the basic rules for Fidchell, one our more obscure games. Rank #7: What’s a Groom Porter? 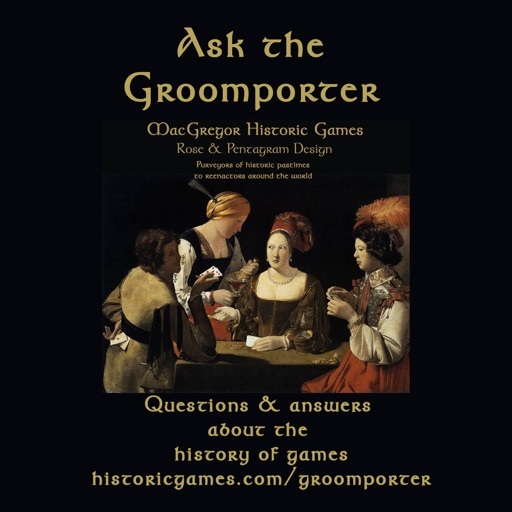 What does that term mean “Groomporter?” Since we’re in the business of researching and selling games of the past I started using Groomporter many years ago as an online nickname especially on history-related internet forums. For my first full episode I explain the term’s origin. Next episode: Who are the kings and queens on playing cards? The theme music is “Scully’s Reel/Mrs.McCloud’s/Cooley’s Reel” by the band Slánte from their Album Cup of Tea and is used under a Creative Commons share-alike license. Submit an audio question by clicking on the “Send Voicemail” link at the upper right corner of the page so I can include it in an episode. Or if you’re shy send me a question through the “Ask a Question” form. Just a test episode so we can get things started. The first episode will be coming out shortly. ITunes does not add new podcasts until you have three or so episodes streaming online so this it my attempt to game their restrictions. The background music is called “Celtic Dragon” by an artist called Oursvince that I found through a Creative Commons website for free downloadable music. Submit an audio question by clicking on the “Send Voicemail” link at the upper right corner of the page so I can include it in an episode. Or if you’re shy send me a question through the “Ask a Question” form. Next episode: What the heck is a Groom Porter? © 2019 OwlTail All rights reserved. OwlTail only owns the podcast episode rankings. Copyright of underlying podcast content is owned by the publisher, not OwlTail. Audio is streamed directly from Ask the Groomporter servers. Downloads goes directly to publisher.